DES MOINES, IA (April 18, 2014) – Iowa employers reported that hospitals and physicians within their communities are either “average” or “below average” on most key performance indicators, according to the 2013 Iowa Employer Benefits Study©, the 15th annual study conducted by David P. Lind Benchmark and Heartland Health Research Institute of Clive, Iowa. Iowa employers pay a large portion of their employees’ health insurance premiums. The typical employer contribution is about 80 percent of the total single premium and about two-thirds of the family premium. Because of this annual investment, Iowa employers were surveyed to determine how they “perceive the value” of healthcare delivered to their employees when compared to the amount invested in health insurance. 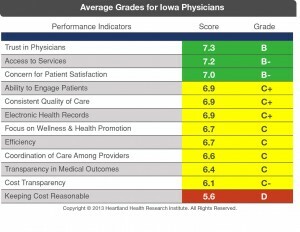 On a 10-point scale, where 1 is “failing” and 10 is “excellent,” Iowa employers were asked to rate the performance of healthcare providers in their communities. 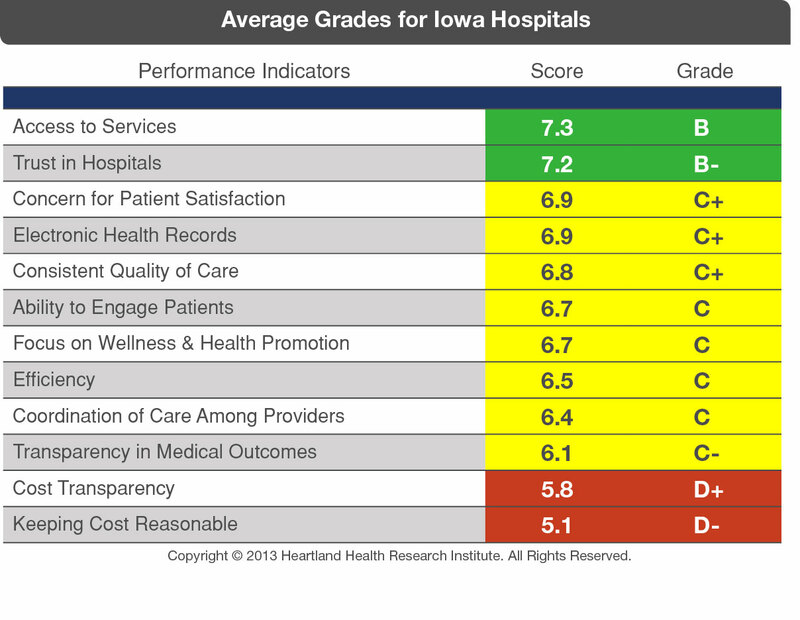 Hospitals and physicians were each graded on 11 key performance indicators. In addition, employers were asked to share their “Level of Trust” for the hospital and physician communities. 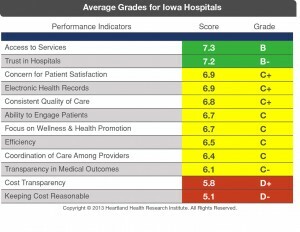 For both hospitals and physicians, there were no “A” grades given statewide for any of the performance indicators. Hospitals were graded a low “B” on a critical measurement – “Trust.” Physicians were graded at a mid “B.” In healthcare, trust is perhaps the most important measurement used to gauge the effectiveness of the services provided to the population. Many studies conclude that trust improves medical outcomes and is a high predictor of loyalty to healthcare providers. 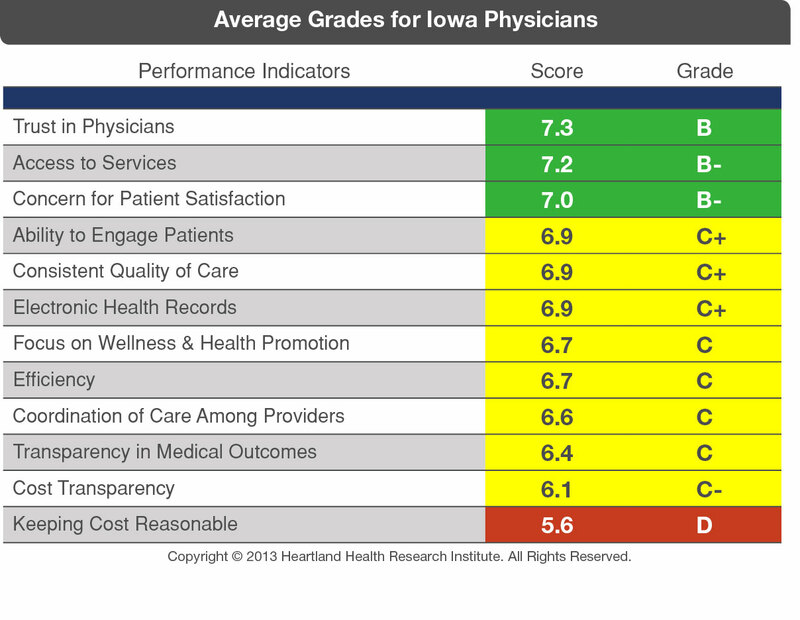 “Having this baseline assessment will provide critical insight on whether our hospitals and physicians are meeting expectations on key value measurements for the stakeholders who pay a considerable amount of the health insurance premium – the Iowa employer,” commented Lind. The 2013 Iowa Employer Benefits Study© was conducted during mid-2013. Results are based on 1,054 responses from 4,378 randomly selected employers with two or more employees. For the overall sample, the results are accurate to within plus or minus 3 percent, at a 95 percent confidence level. Data Point Research, Inc., Ames, Iowa, provided the statistical analysis and mathematical basis for the study. Heartland Health Research Institute (HHRI) is an independent, nonprofit, and non-partisan health research firm located in Clive, Iowa. HHRI is a knowledge-based organization that conducts research on a broad spectrum of healthcare issues and provides unique solutions to both employers and the healthcare community. Topics specifically focus on employer and patient perspectives and measure expectations, satisfaction and trust in the healthcare system. The Iowa Employer Benefits Study© is a comprehensive, statistical review of Iowa employee benefits and health insurance that is conducted annually by David P. Lind Benchmark (DPLB). Members of the media wishing to receive HHRI Press Releases immediately via email, may subscribe to Heartland Health Research Institute’s Press Release Email List.